Bay Area Foundation Repair | Ward Construction Inc.
We keep busy fixing foundation repair problems all over the Bay Area. We do free estimates for homeowners for fixing concrete cracks, floor leveling, retaining walls, drainage, driveway cracks, slab foundation repair, house lifting, foundation leveling, underpinning. There is considerable demand for Bay Area foundation repair, and we are set up to quickly perform estimates for you. When you need a Bay Area foundation repair you don’t want to wait around, and you want a reliable competitive bid. You want your Bay Area foundation repair performed quickly, professionally, and with minimum disruption. Here’s a map showing some a few of our satisfied customer’s job sites in just the Oakland area. We have over 3,000 in our files covering much of the Bay Area and the I-680 corridor. Map of selected installations in Oakland. Our Bay Area foundation repair operations are comprehensive. We repair, lift, and level pier and beam foundations, brick foundations, slab foundations, and garage foundations. A large set of structural engineering skills are required to get this right. Foundation repair starts off with a thorough review by one of our experienced foundation repair specialists. Solving foundation problems may involve pouring concrete footers and slabs, and performing concrete crack repairs and repairing cracks in walls including brick walls. Jobs may require helical piers or helical piles, home underpinning, lifting the foundation with foundation jacks or house jacks. Many foundation repair problems can be traced to expansive clay soils, expanding and contracting during wet and dry seasons. Earthquakes play a role in causing cracks in concrete, and creating the necessity for foundation strengthening and repairing. This image from U.S. Geological Survey shows faults and earthquake activity that keeps unsettling ground causing homes to shift and settle. 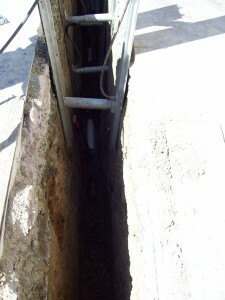 It’s often necessary to first diagnose and repair drainage problems. Proper drainage around homes is critical for stabilizing the soil, and keeping the moisture level consistent. This is necessary because much of the soil in the Bay Area is expansive soil. This means the soil expands and contracts as the moisture levels change. The soil shrinks in the dry summer months, and expands in the wet winter months. As the soil expands and contracts homes experience all kinds of cracks settling, problems with doors and windows jamming, and cracks in the walls especially around doors and windows. It is often necessary to install a retaining wall or retaining walls prevent the problems of poor drainage repairing foundations in Oakland. Retaining walls are often made of wood, concrete, or concrete block. It may be necessary to excavate an area first, build the retaining wall, and then backfill in behind the retaining wall. Good construction of a solid well-designed retaining wall can often prevent landslides, mudslides, and foundation repair problems. If you want a professional estimate, or you suspect you need a foundation repair, be sure and call Ward Construction today at (510) 215-3636.